LOW PROFILE for Sale in Londonderry, NH | DONOVAN EQUIPMENT CO. INC. Designed with visibility in mind, the FISHER® Low Profile tailgate spreaders provide a clear view from the cab when backing up. These single-stage, high density poly tailgate spreaders deliver reliable, professional performance and are perfect for home use and commercial ice control. Available in three sizes to suit your winter service needs in Londonderry, the Model 500 fits vehicles with Class lll hitch and Models 1000 and 2500 fit full size trucks over 6,000 lb GVWR. A fully enclosed 1/3 HP, 12-volt electric motor is mounted inside a sealed housing, protecting it from corrosion. Choose between a variable speed control with an "on/off" button and blast option to optimize material usage or a basic "on/off" toggle control (controls are sold separately). The Low Profile tailgate spreaders feature corrosion-free poly hoppers for long-lasting performance season after season. Material is delivered by a vertical steel auger. The unique design helps break up clumps and prevents material from spilling. Models 500 and 1000 both feature a durable 10" polyurethane spinner that delivers a spread pattern of up to 30'. Model 2500 comes standard with a large, 15" polyurethane spinner that delivers a spread pattern of up to 30'. On the Model 2500 spreader, a specialized "saw tooth" feed gate and auger design combine to deliver complete, reliable flow control with positive shut-off, eliminating spillage and waste. The Model 500 tailgate spreader comes standard with a Class III receiver hitch mount. The Model 1000 tailgate spreader* requires the additional purchase of one of the available mount options: a Class IV receiver hitch mount, a fixed bumper mounting system, or the Dual Swing mount. 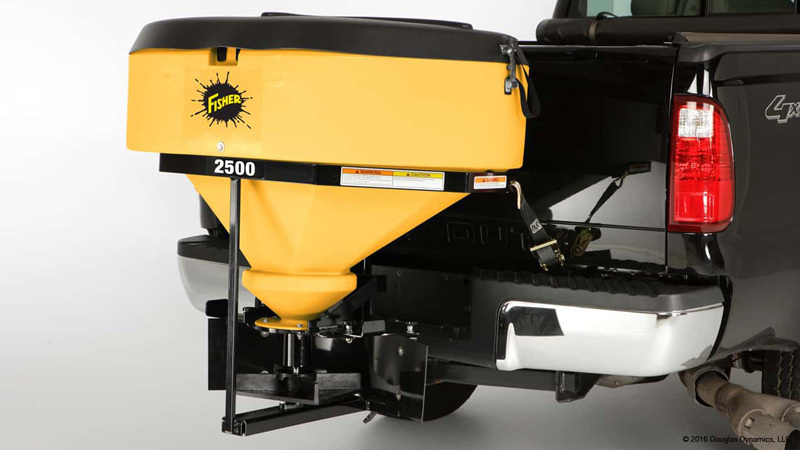 The Model 2500 tailgate spreader comes standard with a Class IV receiver hitch mount. *Mounts sold separately. A steel top screen helps break up large chunks of de-icing material during the loading process to prevent clogging and bridging during spreader operation. It is available as an accessory on all three models. Ratchet straps are provided standard for additional spreader stability on the Model 500 and 2500 spreaders only. Dimensions Overall (LxWxH) 21" x 39" x 34" 19 ½" x 50 ½" x 35" 25" x 50" x 42"
Auger (Diam. x. Length) 2.63" x 6" 2.63" x 6" 2.63" x 9"
Spinner Size 10" 10" 15"